I don't enjoy being away from my family for business trips, but luckily I do not have to travel often. I spent 4 days this week in Chicago for a business conference. My hotel (Hyatt Regency) was right on the Chicago River, and only a quarter mile from Lake Michigan. So I got up early one morning to go running. Heading east toward the lake, I saw a few other joggers out, and decided to follow them, assuming they knew where they were going. After a few minutes, we all found ourselves at the dead-end of a street. With a puzzled look on my face, I asked the others, "I was following you, I thought you knew where you were going?" "No, I'm from out of town and just thought I'd try to run over to the lake." So we were all equally lost. Pretty funny! The challenge with running in downtown Chicago is that there are 3 levels of streets, so even when you can go down, you are probably only dropping into Chicago's underbelly. After several minutes of wrong turns, I finally crossed a bridge over the Chicago River. Looking west, the view took my breath away. 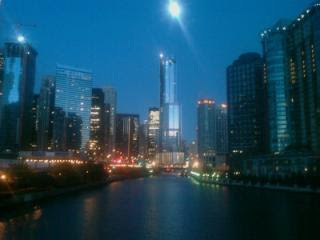 There was a full moon over the Trump building project, and the view was fantastic. I had brought my cell phone along - it has a gps so I wouldn't get too lost - and took a few pictures along the way. 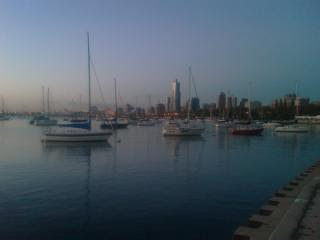 Finally, I found my way down to Navy Pier, and then turned south to run along the lake. It wasn't long before I started seeing masts up ahead, and knew that I was headed in the right direction. The harbors and marina extended for several miles, and I think I ran a lot farther than what I had planned. 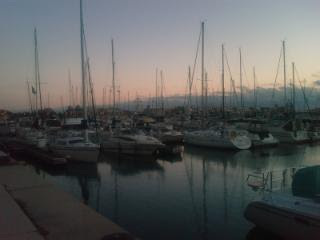 The sun was rising, and there were more boats than I ever get to see back home on Utah Lake. I have been to Chicago several times in the fall, and it is generally quite cold and wet. However this time the weather was really nice. The temperature this morning dropped into the upper 30's, but the sun was rising across the lake and it seemed to be warming up by the minute. Actually, I was so enthralled with all the boats that I wouldn't have minded temperatures into the twenties that morning. I noticed that most of the boats were larger than 30', although there were some Catalina 25's thrown into the mix. Before I realized it, I was approaching McCormick Place, where my conference meetings were held. Oh-oh, that's about 3 miles from my hotel, and I would still need to head back for a shower before starting meetings that day. So I ended up running 6 miles that morning, about twice as far as I normally run. But honestly, if I didn't have meetings, I think I could have run for another hour that morning, my mind was full of thoughts about sailing Lake Michigan, and covetous thoughts about the bigger sailboats idling at their mooring buoys, itching to be sailed.